I just love PINTEREST - don't you? This was inspired by a Pin I saw there. My very wonderful friend Marty came over to help me with this. 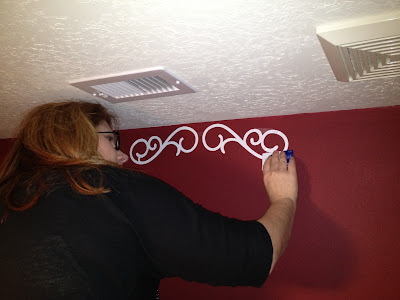 We cut the letters out of white vinyl using my Cricut. The hardest part was deciding which fonts to use and what size to make each letter. We combined fonts from several different cartridges to achieve the look I wanted. I think that part took longer than it did for us to actually cut out the vinyl and adhere it to the wall! 8 hours of labor but it only cost me $15 to make it. Good thing Marty doesn't charge by the hour! Thanks girl for all the help! 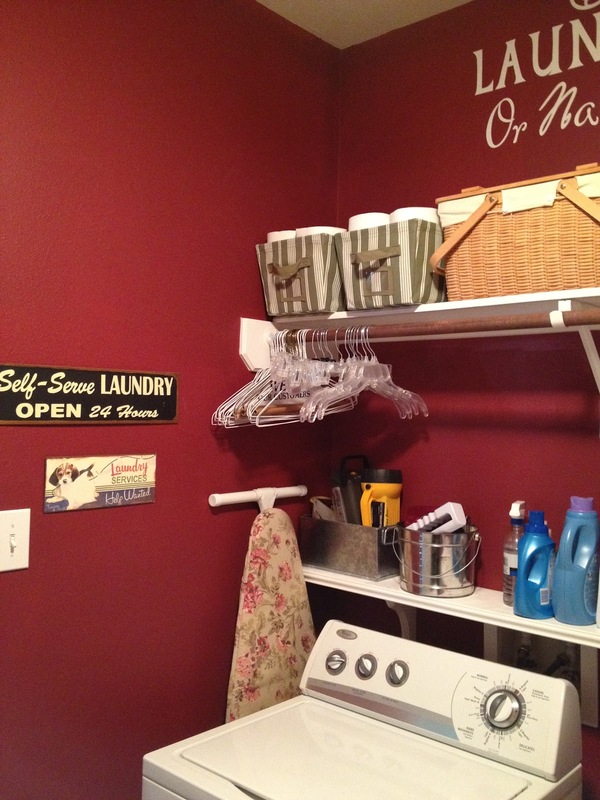 The color for my laundry room was inspired by the metal Laundry Cleaning and Delivery Service sign. I added the white shelf over the washer and dryer and it is very handy for all the laundry supplies and odds and ends that always seem to make their way there and never come out. LAUNDRY TODAY OR NAKED TOMORROW - seems to be a recurring theme at our house! This is really cute. I love the self help signs, my family needs to get a clue on that for sure. Even if they did towels and sheets I would be thrilled. LOL! Don't you just hate laundry! I know I do and I put it off to the last minute. If I ever win the lottery I'm going to hire someone just to do it for me! After 30 years of marriage, I've finally got my husband trained to sort the colors and to read labels! He helps when he can which lightens the load considerably. That's really cute! 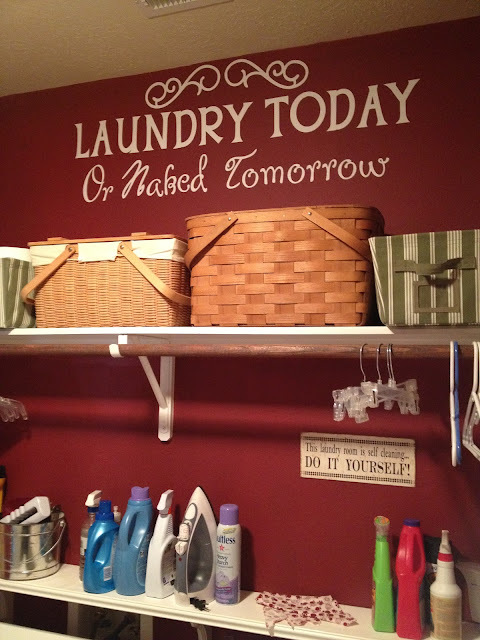 I really like your cute baskets on the shelf, too. Great color combinations. Thanks Kimberly. I love my picnic baskets. The fabric ones have been around forever and I keep meaning to find some in red but just can't seem to find any that I like! Me too Karah! 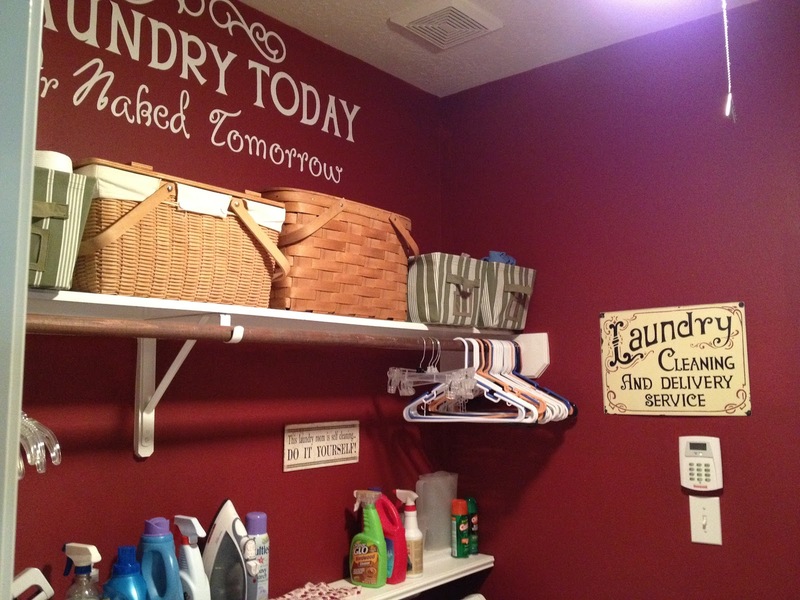 I think anything that can liven up the laundry room is a good idea and this just makes me smile. 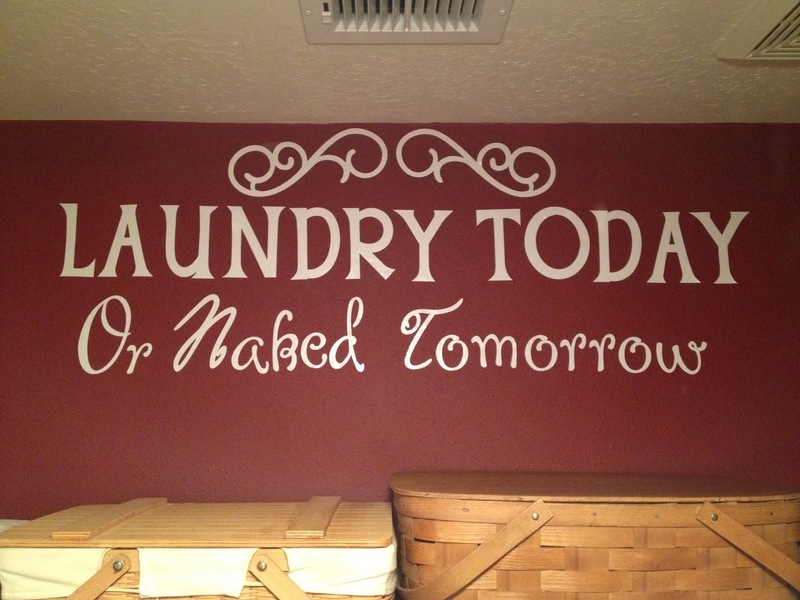 So appropriate for the laundry that I allow to pile up at our house. Don't you just hate laundry? Thanks for stopping by. I'll be sure to check out your blog. Love it. I love the red. Thanks Tara - Although I hate laundry I do love the color! LOL! I love this! Red! Its my favorite color, and love the saying! Thanks Paula! The saying fits our family to a T! What shade of red is this? Thanks!